(1931, Universal) Charles Bickford, Rose Hobart, Georges Renavent, Noble Johnson. We've listed this for years, but only recently seen it for the first time. Wow! This has to be one of the best old-time jungle movies ever made! 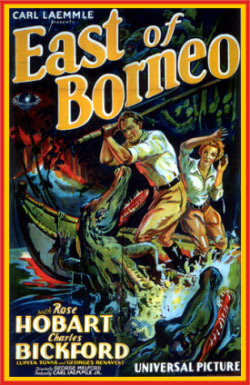 Hobart takes a perilous cruise up a treacherous river into the deepest part of the African Jungle searching for her husband. The expedition is imperiled at every turn by man-eating jungle cats, gigantic snakes, and the unsettling stares of hidden natives. She soon arrives at Morudu, a lost city of ancient temples and giant stone idols. There she finds her husband, Bickford, who is now the physician of the city's tyrannical ruler. Danger soon follows as the ruler's lustful desires drive him to treachery. Some truly eye-popping moments of jungle horror. One scene in particular involves a native criminal and what may very well be the largest number of man-eating crocodiles even filmed! The climax is unforgettable as a nearby volcano erupts and spews forth enormous amounts of stone, ash, and boiling hot lava down upon the city with catastrophic effects. Renavent is marvelous as the evil, lecherous Prince Hashin. Yet, his role is one that would have been perfect for Bela Lugosi. The part reeks with Lugosian dialogue. Renavent's facial shape is even similar to Bela's. An acutely atmospheric film filled with stunning interior and exterior sets. Our highest recommendation! 16mm.